Vesak, also known as Wesak, Buddha Day or Buddha Burmina, is the most important day in the Buddhist calendar. Celebrated on the full moon in May, Vesak celebrates the birth of Buddha, as well as his enlightenment and death. It is widely celebrated in Asia and in many places is an official public holiday. Vesak will next be celebrated on 19th May 2019. There are different ways of celebrating the holiday. Often the festivities begin with a good "spring clean" and homes are freshened up and decorated. In the morning, Buddhists visit their temples and give offerings to the monks of food, candles and flowers. There is chanting and praying, incense, music and colour. There may be exciting parades through the streets. In some areas there will be a "Bathing the Buddha" ceremony, with water poured over a statue of Buddha. Special lanterns of paper and wood (sometimes homemade) are hung from houses and trees, along with electric lights and exciting light displays. Caged birds may be released, symbolising the releasing of sorrows. In China, there may be dragon dances. At Vesak it is traditional to decorate bodhi leaves with colourful paint and hang them up on display. Many are painted with small pictures of Buddha, which is where the inspiration for our Buddha colouring page comes from. 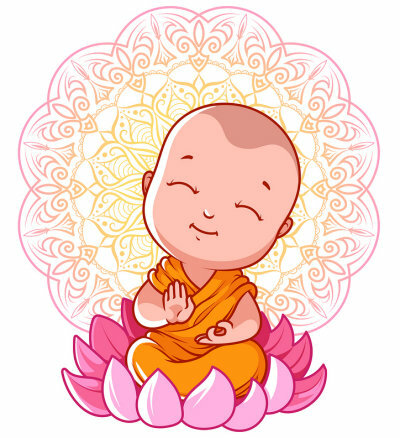 We hope that children will enjoy colouring in this serene meditating Buddha colouring page - perfect for your Buddhism studies or for Vesak or other Buddhist celebrations. There are thought to be over 3000 Buddha footprints all over Asia, carved into stone, rock or metal. The footprints are meant to symbolise Buddha's presence on earth and serve as a reminder that he left a spiritual path for his followers; they contain a variety of typical Buddhist images. You can use this Buddha frame for writing activities, printing it out onto white paper or coloured as you prefer. It also makes a useful template and would look lovely with gold or silver paper. Here's some useful story paper featuring a picture of Buddha. Use it for storing notes, writing projects and more. Trace over the dotted lines to draw this lovely serene Buddha face. Younger children could use a thicker pencil or crayon and trace between the two dotted lines. When Prince Siddhartha was 35 years old, he meditated under the Bodhi tree until he became enlightened. This lovely colouring page shows this part of the story of Buddha. Print out this story paper to use when writing about the life of Buddha. There is also a lovely picture to colour in. The dharma wheel is one of the oldest symbols of Buddhism. It is a chariot wheel, often gold. At the centre you often see three swirling shapes (as in our dharma wheel colouring page below) or a yin-yang symbol. Here's a challenging tracing activity for the kids with many dotted lines to practice their pencil control on. Alternatively, trace or colour in between the dotted lines. He is a pretty lotus flower to colouring. We've left the outlines simple for cutting out if you wish, too. In some Buddhist countries, children make or buy interestingly shaped lanterns and hang them from trees and lamp-posts to celebrate this colourful holiday. You can see this happening in our Vesak colouring page. Kids can cut out these four images, associated with Vesak and Buddhism in general. Younger children might like to follow the dotted lines while older kids can cut the images out directly. Perfect for sticking onto projects and displays. Kids can trace over the letters in Vesak until they are confident enough to write them on their own on the last line. And we've provided two traditional Buddha Day lanterns to colour in, too. This type of lantern is often on display for Vesak in Sri Lanka, but you might see similar lanterns made out of colourful paper and wood hanging all over Asia during Buddha Day celebrations. Print out this Vesak story paper for the kids to use when writing about this exciting holiday. They can use it to record what they've learned about Vesak, write about their own celebrations, or perhaps describe what they can see in the picture. Many, but not all, Buddhists are vegetarian. Perhaps you could prepare and enjoy a vegetarian meal for Vesak? Have a go at meditating with the children! There are many good ideas if you search for "mindfulness for children" or "meditating for children" online. A simple idea to start with is to ask the kids to be very quiet, shut their eyes and sit still, and just listen. What can they hear? Try this indoors and outdoors, and see how long they can sit without fidgeting and what discoveries they make in the process. Vesak is a good excuse for preparing a meal for others, or perhaps donating money or time to a charitable cause.